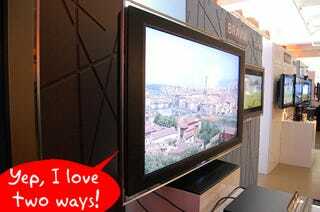 Joining Panny, Sammy and LG, Sony has signed on with the cable industry to support tru2way (aka OpenCable). Basically, sets with tru2way can do everything you'd usually need a set-top box from your cable company for, like VOD, programming guides and other interactive stuff, without the box (sounds like a future Giz Explains!). With Sony now, all of the major TV players are now on board, along with all the big cable companies like Comcast, Time Warner, Cox, etc., so it looks tru2way really might be a national cable standard, and not just a marketing thing with a cheesy brand name out of the mid-90s. Hopefully the cable boxes are now well on their way to extinction. WASHINGTON, DC, May 27, 2008 - Sony Electronics and major cable operators which together pass over 105 million U.S. homes have negotiated and signed an agreement that will enable consumers to purchase innovative "two-way" digital televisions and other devices that can receive interactive digital and high-definition video services without a set-top box, Sony and the National Cable & Telecommunications Association (NCTA) announced today. The terms of the agreement are embodied in a binding Memorandum of Understanding (MOU) negotiated by Sony Electronics and the six largest cable companies - Comcast, Time Warner Cable, Cox, Charter, Cablevision and Bright House Networks - which serve more than 82 percent of all U.S. cable subscribers. Other consumer electronics companies will be beneficiaries of this new national two-way "plug-and-play" platform and have also been invited to formally join the MOU. This negotiated industry agreement establishes the fundamentals for a competitive retail market for "two-way" digital cable-ready devices. It addresses how such products will be brought to market with interactive services like video-on-demand, digital video recording and interactive programming guides. In addition, the agreement makes it clear that consumers will be able to enjoy a choice of differentiated two-way products at retail and through cable operators from a variety of consumer electronics and information technology manufacturers. The agreement includes safeguards to facilitate the development of a robust, two-way retail market and to ensure that cable operators can continue to develop and offer new competitive services. Representative Rick Boucher (D-VA), a senior Member of the House Energy and Commerce Committee and one of the leading advocates in Congress for new technology and consumer freedoms said: "I congratulate Sony and the major cable operators for achieving consensus on a set of core principles that will speed the introduction of new two-way plug-and-play devices." Representative Boucher added: "With this groundbreaking compromise, these industry-leading companies and other major cable companies will ensure that consumers will have broader access to innovative competitive cable ready navigation devices from commercial retailers and will have expanded options to enjoy cable programming, including video on demand and other interactive programming options." As part of the agreement, the parties will adopt: the Java-based "tru2way" solution as the national interactive "plug-and-play" standard; new streamlined technology licenses; and new ways for content providers, consumer electronics manufacturers, information technology companies and cable operators to cooperate in evolving the tru2way technology at Cable Television Laboratories (CableLabs), the cable industry's research and development consortium. The agreement will encourage the development and distribution of interactive and high-value digital content. Key elements of the agreement relate to the deployment of a platform for "write once, run anywhere" applications, and to the incorporation of secure digital interfaces that protect consumers' home recording rights along with copyright owners' rights to secure their digital content. Detailed terms of the MOU have not yet been released, while other potential signatories complete their review of the document. "This marketplace agreement is good news for consumers," said Edgar Tu, Sony Electronics' Senior Vice President of TV Operations of America. "A national plug-and-play digital cable standard for interactive TV receivers, recorders and other products that is transferable and viable wherever you live is ideal for today's mobile society." "This is a landmark agreement which will provide a national, open and interactive platform resulting in more choices of services and products for consumers," said Kyle McSlarrow, NCTA President & CEO.